Summary: Adriana Trigiani, the New York Times bestselling author of the blockbuster epic The Shoemaker's Wife, returns with her biggest and boldest novel yet, a hypnotic tale based on a true story and filled with her signature elements: family ties, artistry, romance, and adventure. Born in the golden age of Hollywood, All the Stars in the Heavens captures the luster, drama, power, and secrets that could only thrive in the studio system—viewed through the lives of an unforgettable cast of players creating magic on the screen and behind the scenes. 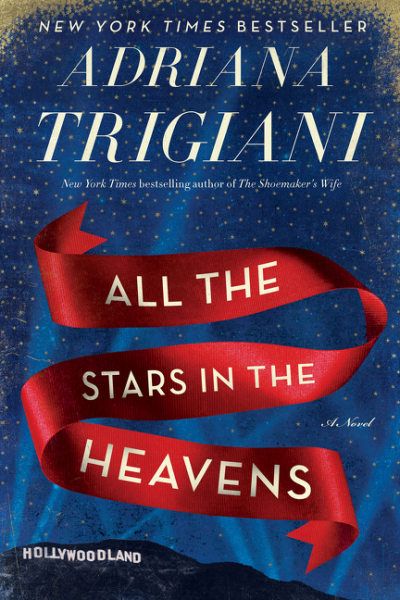 It is with my pleasure that I am part of TLC Book Tours' tour for Adriana Trigiani's new novel ALL THE STARS IN THE HEAVENS. I have been anxiously awaiting this book for some time, and it seems appropriate that her latest story is about movie stars and the golden age of Hollywood given that she recently released her first feature film Big Stone Gap. ALL THE STARS IN THE HEAVENS is a fictional account of Loretta Young and Clark Gable's love affair. The two met in 1935 when a 21 year old Loretta Young met an older (and married) Clark Gable on the set of The Call of the Wild. The cast and crew of The Call of the Wild were on location for the shoot, and the Loretta and Clark's flirtation escalated quickly into a full-blown romance. Meanwhile, Alda Ducci is asked to leave the convent where she's in preparation to become a nun. Despite leading a rather sheltered life, growing up in Italy and then entering a convent, Alda now finds herself in Los Angeles working as Loretta's personal secretary. Alda attempts to keep Loretta, who has tendency of falling for her leading men, out of trouble while also discovering love for herself with a set painter. When Loretta finds herself facing a serious scandal that could potentially ruin her career, she realizes that she needs Alda more than ever. Alda tries to protect Loretta by keeping her private life separate from her very public one, and together they from a special bond that exists for the rest of their lives. I absolutely loved ALL THE STARS IN THE HEAVENS! 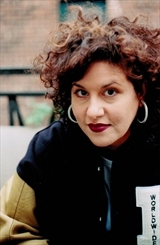 Adriana has done it again -- although that's no surprise to those of us who are fans of her novels. This novel and the story are larger-than-life (just like Adriana! ), and I loved seeing how Adriana blended fact with fiction to make a terrific story. I should probably preface this review by saying that I knew next to nothing about Loretta Young. Basically, I knew her name and that she was an actress during the golden age of Hollywood but that was pretty much it. I had no idea that she was such a famous actress, and I was even more clueless about her possible love affair with Clark Gable. When I read books based on real people, I tend to do a little research on my own; and in the case of Loretta Young and Clark Gable, I couldn't believe what I "discovered!" Now, I'm not going to say much more about this because I don't want to give away what happens in ALL THE STARS IN THE HEAVENS if you are like me and don't know the background! Suffice it to say that I was impressed with Adriana's portrayal of their love story. She did a wonderful job of incorporating the factual evidence with her fictionalized account, and together the stories blended into a special novel. I absolutely loved how she brought 1930s Hollywood and its characters to life, and I was impressed with the amount of detail about movie making and the practices of the studios. Make no mistake about it, ALL THE STARS IN THE HEAVENS is a chunkster. The book is almost 450 pages, and I tend to shy away from books over 350 pages. However, this novel was so good that I didn't mind its length. And that's because Adriana is a gifted storyteller... and because sometimes truth is stranger than fiction! Adriana picked some fascinating characters and a pretty special story to tell, and then she wove everything together to make an compelling story. However, this book is so much more special than just the story of Loretta and Clark's love affair and the fall-out. This story is beautiful! Adriana's writing just keeps getting better and better, and I could tell that this book was especially close to her heart (although I suspect I say that about every project Adriana works on!) Adriana is known for her gorgeous descriptions of... just about everything, and the prose in ALL THE STARS IN THE HEAVENS was no exception. I could vividly picture the scenery, the houses, the costumes, the sets, and more; and I do believe that her writing brought this story to the next level. Another very special thing about ALL THE STARS IN THE HEAVENS was the side story of Alda. I adored Alda and I do think Adriana's writing skills really shined through with her story. Alda was wonderful character and much more complex than I was initially expecting. I appreciated how Adriana used Alma to incorporate her love of Italy and its culture into the story, and Alma definitely made the book that much better with her background story and life lessons. And finally, I found so many feel-good messages in this novel. Adriana is known for writing stories about strong women, and ALL THE STARS IN THE HEAVENS definitely had two very strong female characters. Despite having little in common, Alma and Loretta forged a friendship that lasted a life-time. I appreciated their loyalty to each other as well as the ends they were willing to go to protect those they love. It's no surprise that ALL THE STARS IN THE HEAVENS would make a wonderful book club selection. All of Adriana's books are perfect for book clubs! I wasn't able to find a reading guide at this time, but I'm certain that there will be one available in the very near future. Some of the major themes you might want to explore include loss, second chances, friendship, loyalty, secrets, sacrifice, marriage, and love. It would also be interesting to discuss how much things have changed for women through the years. I adored ALL THE STARS IN THE HEAVENS and highly recommend it to fans of historical and women's fiction! I received a copy of this book from the publisher and TLC Book Tours. Friday, November 6th: Read. Write. Repeat. You know I'm usually not a fan of historical fiction but I loved this book! Trigiani sure knows how to write!! Wow! I can't wait to get to this one! I, too, know very little about Loretta Young, other than she was an actress, and I also like to do research on real life happenings if a book is based on facts. I'm going to hold off on researching Loretta Young until I'm reading the book! I loved this one, too! I also knew little to nothing about Loretta Young, and nothing at all about her affair with Clark Gable. This one certainly didn't feel like a chunkster! Adriana has done it again!